(a) Addresses danger at source. There is a clear statement that while errant behaviour is a feature of people using all modes of transport, the potential to harm others is central to specifying what problem behaviour should be targeted – and that means prioritising misbehaviour by drivers. (b) Goes beyond KSIs. While contributory factors in manoeuvres leading to cyclist Killed and Seriously Injured casualties are considered in identifying close passing as a key problem, the simple fact of intimidation is seen as a problem requiring the attention of the police. (c) Considers the transport policy implications. Law enforcement policy, as with all interventions affecting safety on the road, has transport policy implications. 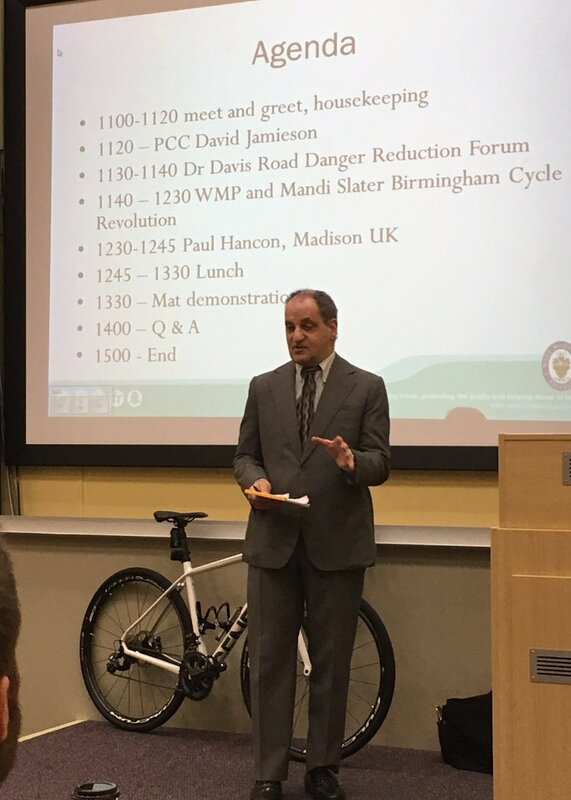 The West Midlands Police (WMP) initiative was clearly and correctly based on supporting not only people who cycle now, but also those who may wish to do so and are deterred by behaviours like close passing. The views of at least some WMP officers expressed here show that traffic police officers may be willing to give a high level of commitment towards a road danger reduction agenda. West Yorkshire Police (in partnership with Leeds City Council) – confirmed. Bedfordshire, Cambridgeshire & Hertfordshire Road Policing Unit – “interested”. Hants and Thames Valley Police – joint operations unit (roads policing unit) due. Police Scotland – up and running: pilot in Edinburgh in partnership with Cycling Scotland’s: “Give everyone cycle space” campaign. The Metropolitan Police Service’s Cycle Safety Team– the UK’s only permanent cycle-borne roads policing team – are working on a new tactic to be introduced in early summer, which incorporates elements of close passing policing. In addition, WMP are actively taking 3rd party video reports (2 mins before and after a close pass) on a private link. (WMP also place their close passing policing alongside the introduction of 20 mph areas and cycle-friendly infrastructure in Birmingham). WMP are also working with West Midlands Fire Service personnel in staffing educational elements of close passing policing and possible provision of out of uniform cyclists. (On a minor point, I note the somewhat loaded connotations of descriptions including “undercover” and “sting” – these operations should not be seen as in any way underhand simply because an officer is in plain clothes). All this indicates a substantial move towards road danger reduction policing. And more police services are asking WMP for information: apologies to those developing close passing policing that I haven’t included, as more are coming on stream. First of all, let’s be clear about traffic police officers. They have one of the toughest policing jobs, frequently criticised by sections of the media. More importantly, there is the risk they face from errant drivers on the roads, leading to injury and death: it is a good reminder to use a search engine to see how often this happens. (Interestingly, the Wikipedia entry on “British police officers killed in the line of duty” excludes “those who die in more regular circumstances such as traffic collisions”!). Most of the traffic police officers I have met are appalled at, and passionately committed against, rule- and law-breaking driving. Our basic position is therefore one of respect and support. However, there are two issues. Firstly, their views may not be shared by senior officers managing them. More importantly, we have a general problem of how their views will inevitably be formed by the society they are a part of. Throughout the eighties and onwards, staff in public services – the NHS, local government and also the police and armed services – have been told to be aware of the prejudices they may hold. These are primarily prejudices against people on the basis of their sexuality, gender, ethnic group or disability, the central point being that people will tend to reflect the beliefs of the society they are brought up in. If these beliefs are discriminatory, people will hold prejudices, often quite unwittingly, which will result in disadvantageous treatment of some people, and resultant failure in the effectiveness of the services they are required to provide. That is a very brief definition of the equal opportunities policies that public service professionals are required to adopt. The emphasis is on getting public servants to question basic ideas that they may not even be aware they hold. It is not about blaming people for holding these views – rather, it is about assisting them in their work by showing how they may quite unwittingly be mistaken. It is critically important to remember this point: far from being “political correctness”, this is about remembering that people reflect the belief systems of the society they are brought up in. And in this area, we are talking about the various ways in which most people have accepted the dominance of the car and motorised transport, specifically in tolerating everyday rule and law breaking by motorists. There is of course, the “choice” question. It is often argued that an equal opportunities model doesn’t apply as the issue of, for example, riding a bicycle, is essentially a question of choice. It is self-selected. One does not have to ride a bicycle. While this is correct, it is also true that one does not have to drive a car – or at least not in a rule- or law-breaking manner. Anyway, there is also the model of Health and Safety regimes in areas such as Health and Safety at work. Under these regimes, workers – or people who have chosen to work as, for example, construction workers – are protected by regimes where it is ensured that the environment they work in is as safe as possible. 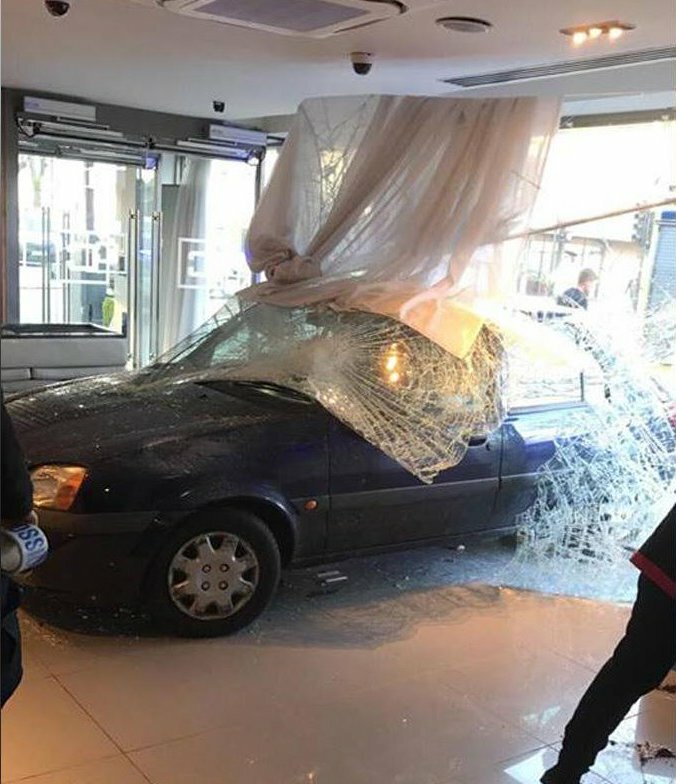 If that idea were to be dominant on the public highway – with the danger from motor vehicles to other road users treated in the same way as danger to workers on a construction site – we would have a completely different attitude prevailing. On that basis it seems that we are entitled to expect that police officers should question the dominant car-centric views that hold sway in British society, in the sort of way that they are in West Midlands Police. Against this, it might be felt that traffic police officers – who, it must be repeated, are often putting themselves at a high level of risk in their work – have good intentions. But good intentions are not only not enough, but frequently “pave the road to hell”. Traffic police officers are the first to know that most road crashes are caused by otherwise good people doing bad things. Being a good person is simply not good enough when it comes to the causes of road danger. Let’s see how prejudice against cyclists and in favour of rule/law-breaking drivers exists with the examples of just one county police service and the Metropolitan Police Service. This is a selection of cases in one police service. It is not too cynical to suggest that similar problems may exist in other police services in the UK. Also – noting that Hants Police have made a commitment towards close passing policing – it is quite possible that some good work can be done at the same time as questionable attitudes prevail elsewhere in the same force. As the largest police force in the UK by far, it’s worth having a look at some current issues with the MPS. This is not any kind of systematic analysis, rather a selection of some views expressed at the highest level which give cause for concern. Detective Chief Superintendent Paul Rickett is OCU Commander of the Roads and Transport Policing Command (RTPC). Jointly funded by Transport for London (TfL), the RTPC is the largest operational command in the MPS, comprising 2,350 officers and staff, whose role is to provide safety and security across London’s road and surface transport infrastructure. On 24th January 2017, at the centenary conference of the London Road Safety Council, he highlighted and denounced: “A symptom of post-modern libertarian democracy” which troubled him. His concern? “I can’t believe that cyclists are not required to use the Cycle Superhighways”. I think it’s worth spending some time on this issue and DCS Rickett’s vexation with what may be happening on some 0.145% of the roads he oversees. In neither case were arrests made. So why the need for new laws, when existing ones are routinely flouted with a minuscule chance of arrest? In his evidence to the All-Party Parliamentary Cycling Group on 22nd February 2017 (you can hear it here ), DCS Rickett was asked if the current suite of offences was adequate. His only suggested addition was, yes, the problem he has that he cannot enforce the non-use of Cycle Superhighways, and that the CSH outside his office is often “empty and the road filled with cyclists”. You can hear his evident vexation and the amount of time expressing it from 30 – 36 minutes. I think this tells us something about the attitude towards cyclists and cycling of the officer overseeing policing of London’s roads, and it’s worth looking at in detail. It troubles him that the CSHs are there “at huge expense”. But the expense, certainly nationally, is trivial compared to the spending on other road infrastructure. Even in London, there is plenty of new road building, and the usual spending on “safety engineering” to accommodate rule- and law-breaking driving. One can furthermore argue that motorists impose massive external costs with regard to their danger, pollution, space consumption etc., which they don’t pay for, and are therefore subsidised “at huge expense” .This is not an abstract academic issue: in a culture where drivers see themselves as paying tax (“I pay road tax”) and cyclists not, emphasising the spending on CSHs feeds into a commonly held prejudice. There’s an echo of the Secretary of State’s infamous remarks about cyclists “not being road users” . All transport professionals know that the CSHs are part of the public highway or “road” – yet DCS Rickett persistently describes them as being distinguished from “the road”. Now the likes of DCS Rickett should be answered using rational argument. For example, the building of segregated cycle lanes on CSHs seems to have generated more cycling – which rather contradicts the idea that cyclists are using “the road” instead. Or it can be mentioned that there are often obvious reasons for not using a CSH lane: most are bi-directional, requiring additional movements across traffic to enter and leave if going from or to the other side of the road. These additional movements increase delay and also possibly danger. But while rational argument is necessary, as with so much else, it won’t win the day because what is at issue is essentially ideological. The matter in hand is essentially about something unspoken: who the roads are for and how, when and why they may be used. My suggestion is that for DSC Rickett and much of mainstream culture, the roads are for motorised traffic, with almost all driving (including rule and law breaking driving) being acceptable. On the other hand, cycling is seen as suspect and problematic, with cyclists as a problem. There is a long history of cyclists being concerned about segregated cycle lanes/tracks on the basis that they would marginalise and “ghettoise” them. Part of this is based on the fact that much supposed “provision for cyclists” has been inadequate by today’s standards: inconvenient and potentially more hazardous for cyclists. Part of it is that, even with a network of high quality protected cycle lanes, most cycling will still be on the public highway in the immediate vicinity of motor vehicles: so drivers still have to be aware that they cannot expect cyclists to be somewhere else on most of the roads they use. This worry is that provision for cycling based on the principle of segregation on main roads holds a fundamental danger for cyclists. It will allow drivers to think that cyclists are a problem to be got “out of the way” (e.g. where drivers feel they have a right to proceed at whatever speed they feel is right for them). The RDRF view is that we should proceed with the current nominal official commitment, most notably in London but also elsewhere, towards networks of segregated cycle lanes as a means of encouraging people scared of the hazards of cycling to cycle. That doesn’t stop us from being wary and watchful of attitudes based on seeing cycling as a problem to be got “out of the way” of drivers. There are other reasons for cyclists not using existing cycle “facilities”. They may be blocked by parked cars or debris. As such, Cycling UK has successfully defended the right not to use them . Many will not be fit for purpose under the current best practice design standards. Many cyclists have had the experience of being hooted at by irate drivers for not using a supposed “facility” which it was not appropriate for them to use. Indeed, DSC Rickett notes in his APPCG evidence that any legislation requiring cyclists to use segregated cycle lanes would have to be very specific. I think that even with carefully drafted legislation, it is likely that plenty of drivers would still feel that a cyclist would be required to be “out of their way” even with a cycle lane /track which didn’t get covered by such legislation. Again, we are dealing with prejudice rather than rational argument. 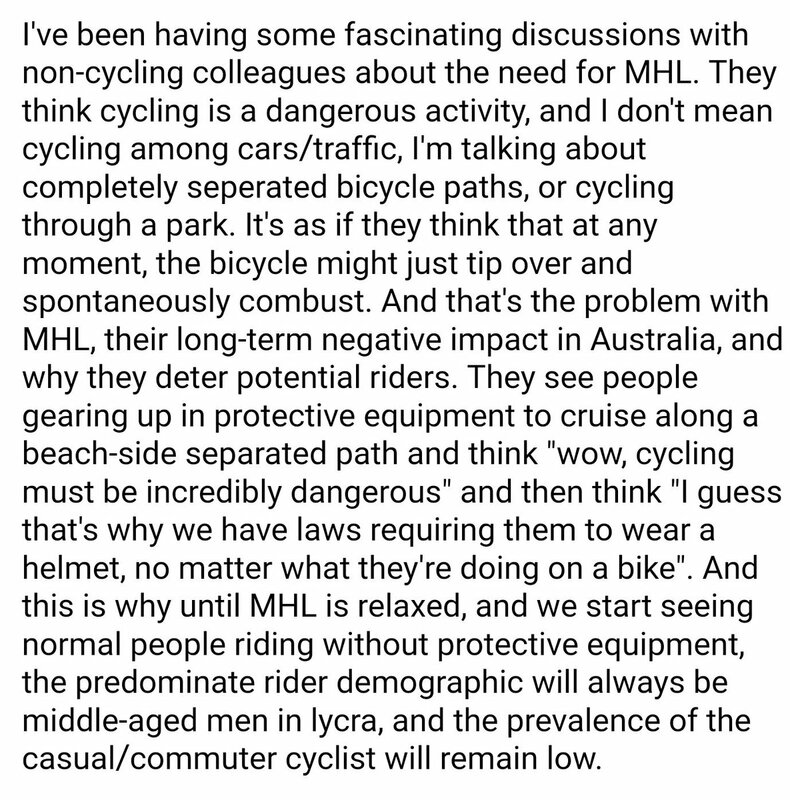 Indeed, even just restricting campaigning to achieving the objective of a network of high quality segregated cycle lanes, such negative attitudes pose a threat to the well-being of actual and potential cyclists. And it seems that they exist at the top of the MPS with the officer (who reports to the Deputy Mayor for Transport, Val Shawcross, who plays a key part in overseeing provision for cycling). I think there are other things to be said here. I get the impression that the installation of protected cycle lanes on some 0.154% of the capital’s roads, with the (now questionable) hope of this rising to some 0.45% during the current Mayoralty, is seen as some sort of special present to cyclists. But it is not. It is there to attract potential cyclists rather than those who are proficient and willing to cycle on London’s roads. One could argue that it is there for motorists, so that they don’t have to worry about the presence of cyclists (as explained above). Above all, allocation of dedicated space to cycling is supposed to be there to provide part of the solution to London’s problems generated by excessive dependence on motor vehicles, particularly private cars. It might be worthwhile seeing any favours as being done by, not for, cycling and cyclists. I’ll spend less time on some of the other views expressed by DCS Rickett. Suffice it to say that they betray inadequate or negative views of cycling. 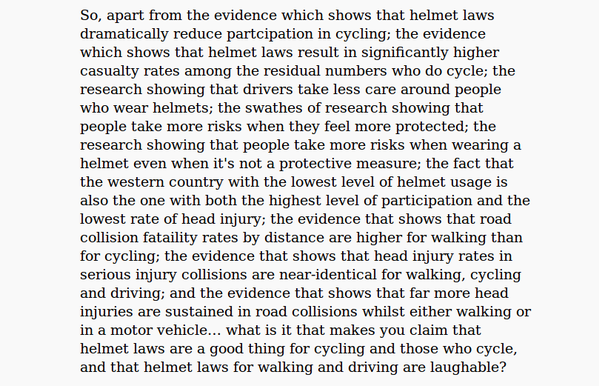 As with helmets, so too hi-viz (1 hour 6 minutes), although no evidence is claimed and this is “just my opinion”. 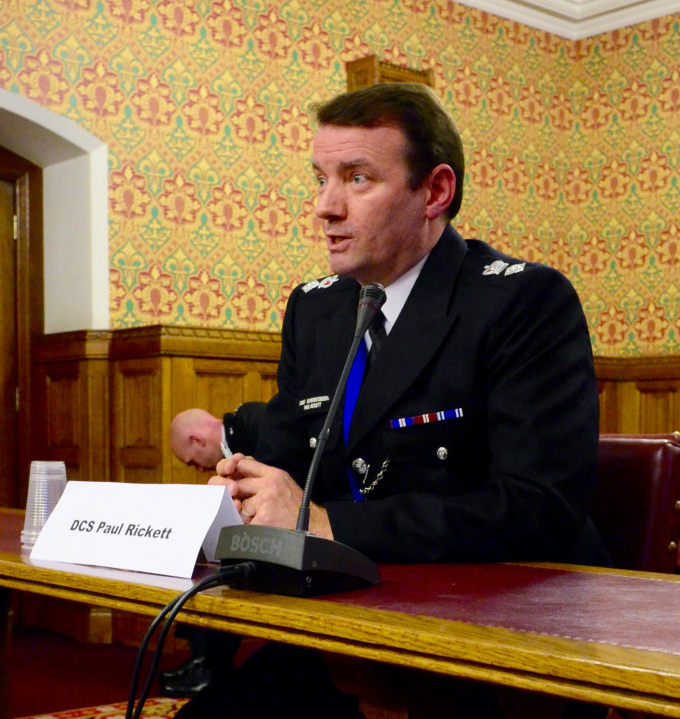 DCS Rickett seems cool on policing 20 mph areas (37 mins), seems to be more concerned with policing cyclist behaviour – as with “cyclist rideouts”, whatever they are – (59 minutes), and unaware of the discussion raised about use of Section 59 of the Police Reform Act (discussed among officers at our award event last year). Finally, we have the case of Michael Mason, killed while cycling in London in February 2014, which we have discussed here and here . The case is notorious because of the decision of the MPS to not pass the papers on to the Crown Prosecution Service. The family raised funds for a private prosecution. DCS Rickett defends this decision (49 minutes 30 seconds); our view is different. We’ll see what happens in the private prosecution, which is due next month. Before we leave the Met, let’s have a look at a case reported last month where a woman cyclist knocked down by a van driver suffered “bleeding, bruising and a black eye and said that it was only because a black cab had been following at a distance that it was able to avoid running her over as she lay sprawled in the road.” And once again there was a failure to prosecute for even the charge of careless driving. It is worthwhile reading the account of this case in detail – including the comments below – here . 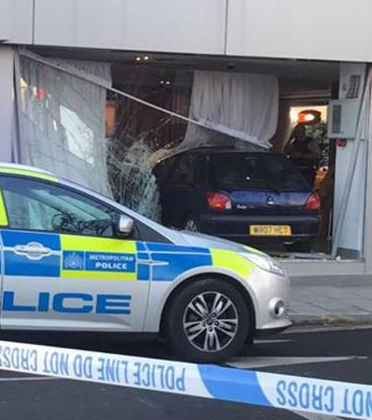 “If this represents Met Police policy they might as well say that they are just not bothered about careless driving, as long as nobody suffers a life-changing injury. This driver’s lack of attention and bad driving was no less careless just because Ms Singh was lucky, and was merely bloodied and bruised rather than paralysed. Of course, this is just one case – albeit reported recently and following persistence from the victim. It’s unlikely that we even hear about most such cases. 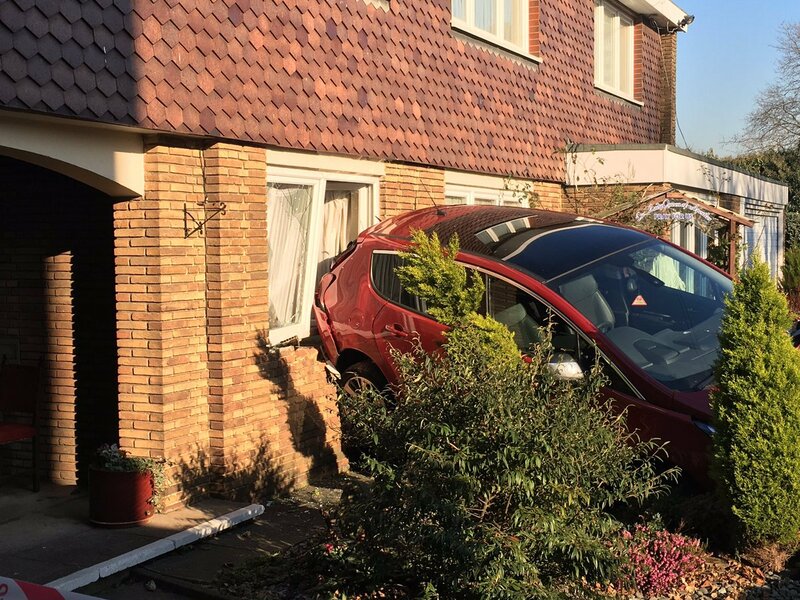 We need to repeat the point: what kind of messages are the MPS sending out about the standard of driving that should be – and legally is – required on London’s roads? In the past we have criticised the Met about its traffic policing Sometimes this has been a little unfair – for example, some of the prejudice against cyclists may have come from officers drafted in to Operation Safeway who don’t have the expertise of traffic officers. We repeat our support for traffic officers throughout the UK, and feel they deserve recognition for the necessary – and often hazardous – work they carry out. In particular, we look forward to the close passing of cyclists policing that is developing throughout the UK following the West Midlands initiative. Nevertheless, this will be only part of the work that the police can – and more importantly in our opinion should – be doing to reduce danger from careless, dangerous, criminally negligent, rule and/or law breaking driving that increases danger to other road users. Some good features of policing do not remove the failures in attitude and practice that we refer to above. Obviously this review is not a systematic study of the MPS and all other UK police forces. It also does not address the fundamental issue of what happens after policing, with courts giving lenient and non-deterrent sentences to offenders. That is a matter deserving of separate attention – although we feel that a senior police officer giving evidence to the APPCG could at least suggest the need for deterrent sentencing. But we believe that we have highlighted areas of concern that need change if we are to have the civilised approach to road danger of which policing is an integral part. The close passing policing initiatives show that there is a desire for road danger reduction measures among traffic police officers of all ranks. That will require eliminating old prejudices, and we are here to assist with this. The biggest shift needed to achieve road danger reduction for cyclists in Kent is proper enforcement of speed limits. High speed traffic in urban areas is a huge deterrent for nervous new cyclists. Kent Highways and Kent Police say fixed camera enforcement is only allowed when there is a serious KSI record of three crashes in three years on any road. This is in line with the KCC Casualty Reduction Strategy which basically ignores any driver behaviour that doesn’t cause a crash. So motorists are encouraged to think that speeding on its own is a victimless crime. I used to run a Speed Watch group but we stopped after three years when we realised this was just a figleaf for the authorities’ unwillingness to tackle speeding properly in 30 mph areas. Police patrols can’t do it and the technology of speed cameras is easily available. The political will to stop speeding just isn’t there when our county council is committed to ‘cutting motorists’ journey times’. This APPCG is just the Westminster gasworks&apos; cycling club—not an actual parliamentary committee or anything with any real powers or responsibility, right? If so, why did they let DCS Rickett air his prejudices for upwards of 37 minutes (didn&apos;t listen to the audio to find out how long) rather than just swiftly throw him out on his ear without biscuits or travel expenses and ask GLA to sack and blacklist him? What were the members expecting to learn from this that they didn&apos;t already know? Interesting comments johnmmorrison. One thing I would say is that speed cameras don’t need to be fixed – there are mobile ones available. Very few around here. One deployment every six months or so on the road where we did Speed Watch. Which is itself a great argument for fully segregated facilities, but they’re no use unless they are fit for purpose and connect to where people want to go.